rainscreen cladding systems, roofline, column casings, perforated panels, pipe boxing, modular and other specialist fabrications. With over 50 years manufacturing experience and the most advanced cutting and folding technology to hand, we have created 5 market leading rainscreen systems that have been independently tested and accredited to the specific requirements of CWCT. All our systems come in an unrivaled choice of materials, colours and finishes to help you bring your design to life. Coreclad A1 is a range of pre-coated aluminium material available in all standard RAL and accent colours, anodised metals, metal patina’s, woodgrains and natural stone effects. Other finishing options are high matt or high gloss, smooth or textured. Stocking over 10,000m2 of the most popular standard, natural and textured finishes, we can manufacture and supply a CWCT tested rainscreen system in less than 3 weeks. Other reasons to choose this material range. In our January newsletter, we take a look at what the Eltherington R&D department are working on in 2019. The Eltherington Group Research & Development team have a combined 90 years of experience working in the design, construction and manufacturing industries. 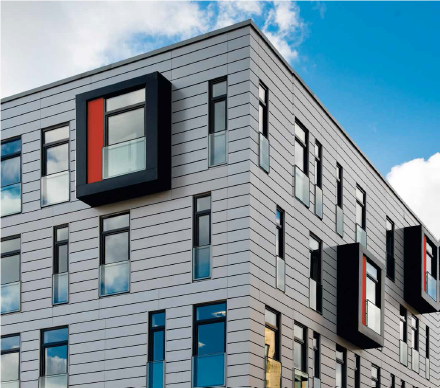 Back in 2017, the architectural division of the group set the R&D team a challenge to use their technical expertise to develop a completely new rainscreen cladding product range. Something new and superior to current systems on the market. Something beautiful and unique that brings the building to life.